Manchester United and Chelsea are chasing Dortmund midfielder, Shinji Kagawa, according the German newspaper, Bild.The Japanese International only joined the Bundesliga leaders in the summer, but he has been in superb form since his move from Cerezo Osaka. He has already hit 8 goals in the league and even smashed in two against arch-rivals, Schalke, quickly making him a fan favourite. 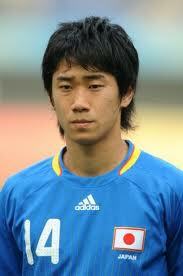 Kagawa is currently away with Japan playing in the Asia Cup. Given the current circumstances, it is unlikely that a January transfer might occur, but Chelsea and United may be looking to line-up a summer swoop if the 21-year-old continues to impress. Manchester United are no strangers to dealing with Asian stars, the progression of Ji-Sung Park at Old Trafford has been a triumph. The advantage of having world-wide stars is not only for their talent and ability, but also their marketability. The inclusion of Park in the United team has helped promote the club in Korea and the potential signing of Kagawa could do the same in Japan.